Successfully Added Cell Phone "StylAir Novus" - 3.2 Inch Touch Screen, Dual SIM, Dual Camera, WiFi, FM Radio, Quadband to your Shopping Cart. 3.2 Inch Touchscreen Mobile Phone featuring Quadband, Dual SIM, Dual Camera and WiFi is a stylish but no-nonsense mobile phone for an extraordinary experience at a budget price. Elegant doesn’t have to be expensive and the “StylAir Novus” proves this with a stylish design and solid construction for a fantastic and durable experience at an awesome wholesale price. Its shape makes it fit agreeably in the palm of your hand and due to a large 3.2 inch touch screen makes it really easy on the eye and very convenient for your fingers to navigate through all the applications available inside. This beautiful mobile phone is fully unlocked and supports the four global standard GSM frequencies (850MHz, 900MHz, 1800MHz, 1900MHz), which means it works anywhere in the world. There is room to insert two SIM cards so you can receive calls on both phone numbers using just one phone, which is ideal for those who need to separate work and private life, business and play. Stay connected to the Internet and your friends via WiFi, or use Bluetooth to exchange files as well being able to watch analog TV, take photo easily in any position with the dual camera, all this is just part of all the functionality offered by the “StylAir Novus” The heart of this phone is a powerful CPU paired with a smooth interface, and you get all the ingredients of an incredible cellphone for every aspect of your busy life. This 3.2 inch touchscreen mobile phone “StylAir Novus” featuring quadband, dual SIM and many other features is a stylish designed, core performance phone at a great wholesale price. In stock now and ready for immediate shipment with a 12 month warranty. 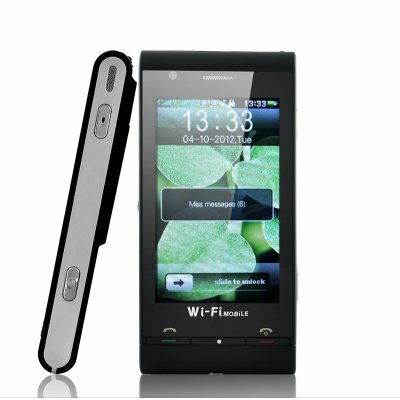 Brought to you be the leaders in electronic devices and cheap mobile phones, Chinavasion. WiFi, Bluetooth, analog TV, FM radio, and More! I am still debating on new phone.this phone has made the decision for me,i will buy it. THANK YOU CHINAVASION FOR A GREAT CELL PHONE I DIDNT WANT TO SPEND HUNDREDS OF DOLLARS ON A PHONE ,SO I BOUGHT THIS AND LOVE IT. IT DOES JUST ABOUT EVERYTHING A SMARTPHONE DOES ,I LIKE THE RADIO AND WIFI IT HAS AND BEING ABLE TO PLAY GAMES ON IT . I HAVE HAD IT FOR 3 DAYS AND LEARNING MORE FEATURES EVERYDAY.